Rinse and slice red potatoes. Empty contents of Right on Ranch packet into gallon size zip lock bag. Coat potatoes with Olive Oil and place in bag. Shake until potatoes are covered with seasoning. Place potatoes in tin foil with a bit of butter, close foil and grill approx 20-30 minutes per side until potatoes are soft. 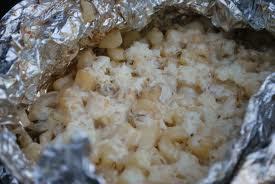 Use several foil packs to cook potatoes evenly. When done, open and sprinkle with Colby and Monterey Jack cheese. Close pack and let cheese melt. Do not put back on grill.